Same here... no .uis file to install the skin!!! Im sorry for the trouble, Ill try re-packaging it again. Haven't played much with the skin much,but I like this so far. Thanks for updating/adding the .uis file; the skin loaded perfectly. Really slick skin, keep up the good and creative work. 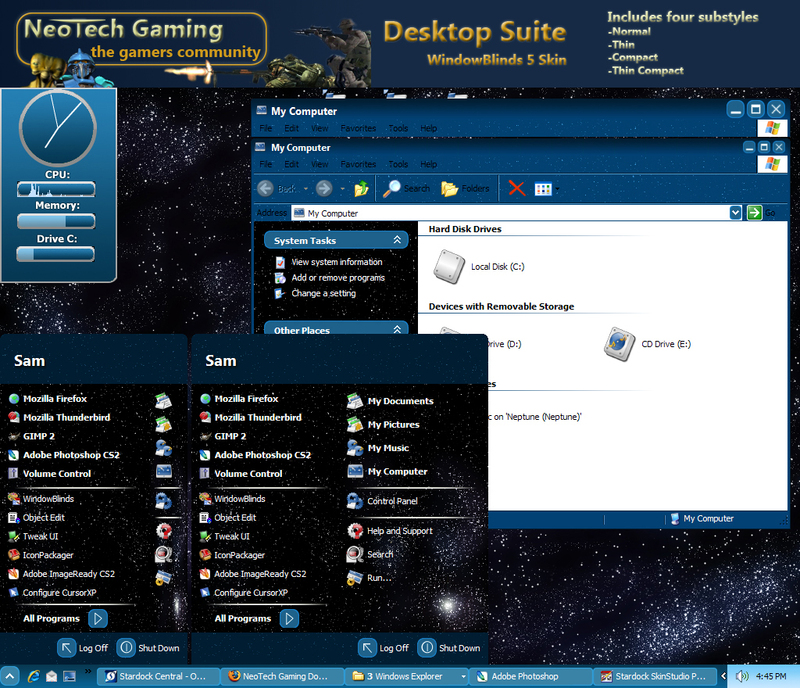 The wallpaper can be found in C:\Program Files\Stardock\Object Desktop\WindowBlinds\NeoTech Gaming. They are NTG Wall 1024 and NTG Wall 1280. This is an update to the original version. It doesnt have to do with gaming at all. It is a skin for the site neotechgaming.com. yeah, i don't think I would use something like this either. It seems very, ummm...unprofessional and unrefined. I like the systemtray, but other than that, it's just way too unrefined. As oOSHUUMIOo said, it isn't very clean or crisp. The stars will be weeping tonight! I'm not too sure about this one, Sorry to say this but it does look a bit lame, This might of been better if you had put a bit more detail into the Windows Frames amd the start menu? Sorry for the lame comment but i'm just not liking it "Too Basic"